One day, I got an email, a text message, a phone call, a Facebook message and two tweets within one minute. Not because I work in Marketing, but just because that’s how life is for everyone right now. If you feel that notifications run your life, you are not alone. We put together some information about how to manage your notifications mindfully, so you can be fully present in your life. Turning off all your notifications is an extreme path to take. And would it solve our chaotic real-time communication? Probably not. And chances are high that we – as knowledge workers – feel anxious, a fear of missing out. And chances are high that we miss out. We probably miss the important notification from our co-worker regarding their latest design draft. Or the status update on the latest website update. Or simply the question if we want to join the product team for lunch. To be honest, we would miss quite a lot. So turning off all our notifications isn’t a great help either. So how can we make our notifications ‘smarter’? How can we make sure that we are in full control and not the other way around? A 2012 McKinsey study found that the average knowledge worker spends close to 30% of a worker’s time dedicated to reading and answering e-mail alone. So, real-time collaboration has become an essential part in our daily online life. Slack messages, emails, Trello updates, Usersnap screen: It’s hard for a team to stay on the same page for every single issue. In order to perform deep work, a distraction-free environment is needed. But in order to be your best you need to stay updated throughout the day. That is the modern life conundrum of our time. We need to be available for questions and requests and at the same time, we need peace and quiet time to be our best. But there are some best practices on sending notifications, which might be helpful when you are building your digital product. How can we create a mindful – yet productive – work environment for our customers and users? How can we utilize different notification channels to fulfill different needs? The best way to be respectful in this relationship is to give the user control over what types of notification they want to receive and with what frequency. In theory, it sounds easy: You hand over full control to your users and customers and hope that they’ll receive the right notification at the right time and make the best decision for themselves. Let’s take a look at how Slack sets up their notification process. Users can be muted in channels. Or activate a temporary “do not disturb” mode. But what if their device settings don’t allow certain notifications? There are a lot of thoughts which go into the process of building and sustaining great notification channels. 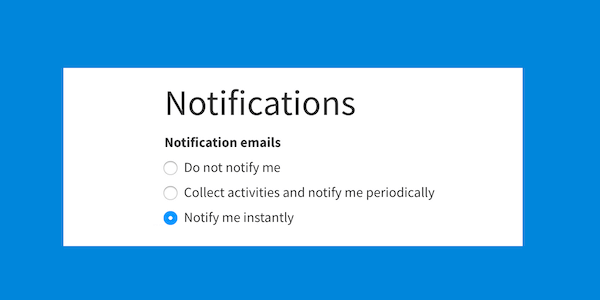 Notification needs are different for everyone, which is why we at Usersnap want to give our users control over when and how to receive notifications. To learn more about how to set up our newly launched notifications inside your Usersnap account, please log in to your account or visit our help center for a step-by-step guide.